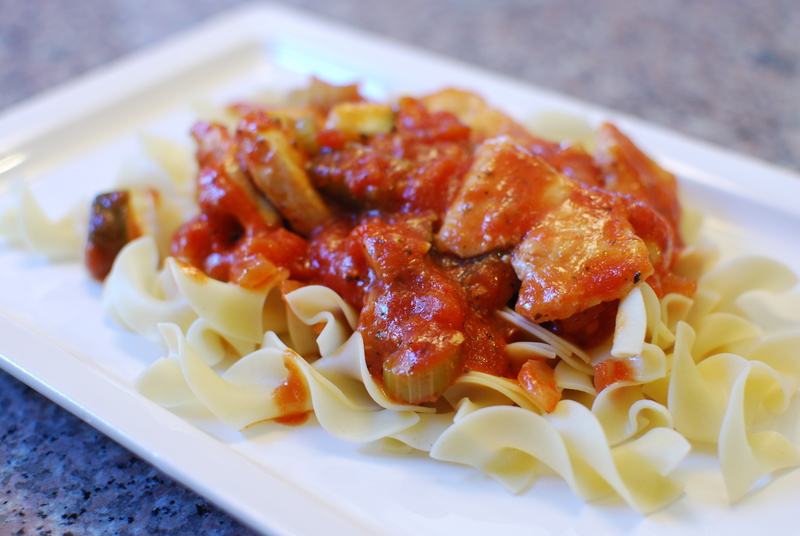 I really love chicken cacciatore, but it takes too long to make. I found a recipe that reminded me of chicken cacciatore, and it took a fraction of the time to cook. Everyone devoured their dinners. Win, win! Note: the original recipe (and as pictured) called for celery, but I’ll omit the celery next time. Add mushrooms if you’d like. Adapted from “Chicken Creole” from The Southern Lady Cooks. Heat olive oil and saute chicken pieces until no longer pink. Remove and keep warm. In the same skillet, saute the onion, green pepper, and zucchini in the remaining oil until tender. Stir in the tomatoes, broth, tomato paste and seasonings. Bring to a boil, reduce heat; cover and simmer for 5 minutes. Return chicken to the pan; heat through.